Will you develop the website in-house or hire an agency? Which platform will the site be built on? There are a ton of options out there for each of these questions. Wading through them can be downright overwhelming! Any options that make matters easier for you are surely welcome. Today we're going to dig in to platforms and talk about the HubSpot CMS. Ascend has been building websites for over a decade now. We started on Wordpress, and still build a lot of our sites there. A couple of years ago we started building on the HubSpot CMS. We're seeing incredible results for our clients on this platform. This all-in-one tool makes it easy to not only build your website, but to manage it. There are other tools out there aimed at making it simple to create a website (Wordpress, Wix, Squarespace etc.). But they often lack the robust features of the HubSpot CMS. Or, they require additional plugins or software to get the same functionality. The HubSpot CMS is mobile-ready out of the box. Mobile devices have become the primary source of Internet traffic. Practically everyone has at least one mobile device these days. We use them to look stuff up, shop, and to connect with friends and family. If someone can't find the information they are looking for right away, they will leave. You only have a few seconds to convince someone to stick around your site. Your first impression needs to great. By having a mobile-ready website, you're ensuring that your website appears properly on all mobile devices. This will allow it to load quicker and look better, providing your visitors with a better experience. Gone are the days where you only had to focus on making your website look great on a computer monitor. Without the HubSpot CMS, making your website mobile-friendly is a little more complicated. For instance, if you're using WordPress, you need to find a mobile ready theme. Even when themes are advertised as "mobile ready," you often still have to make customizations to the CSS and HTML to make things look just right. Or, if you're designing your website from scratch, you have to put in a lot more work to make sure it appears the right way on small mobile device screens, and still works properly. With the HubSpot CMS you don't have to worry about any of this, making your job a lot easier. Now you'll be able to best serve your audience on whatever device they use. For this to work, you need to regularly post valuable content. Falling behind on your content schedule will not only make it harder to build up an audience, but it can negatively impact your search engine rankings. To keep everything organized, you need a good content calendar. The HubSpot CMS comes with built-in tools that allow you to track all the different blog posts you're working on, and to collaborate with your team members. From this tool you can plan out each phase of your writing process, to ensure that everything gets done on time. While there are other services out there that will allow you to create a content calendar, having it in the same place as your website makes things much easier. The best way to improve any website is by studying its performance and learning from the data. Without any sort of analytics or data tracking, you won't know how many visitors you're getting, which pages are converting visitors to leads, or how people are typically finding your website. You then won't be able to make changes based on this information, and will essentially be flying in the dark. 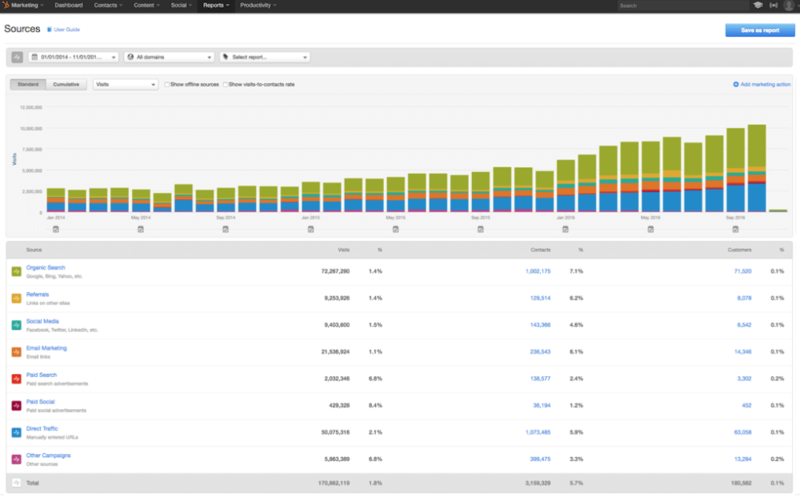 The HubSpot CMS comes with its own analytics section, so you can see the data behind your website and learn from it. Other CMS options typically don't have this, and you need to use third-party products in order to get it. Yes, Google Analytics is available for free and it's a great tool for measuring traffic. We install Google Analytics tracking on every site we build. However, setting up custom conversions and goals can get complex in a matter of no time. With the HubSpot CMS, goals and conversions are tracked out-of-the-box. Plus, you have that data right there in the same place you manage your website. 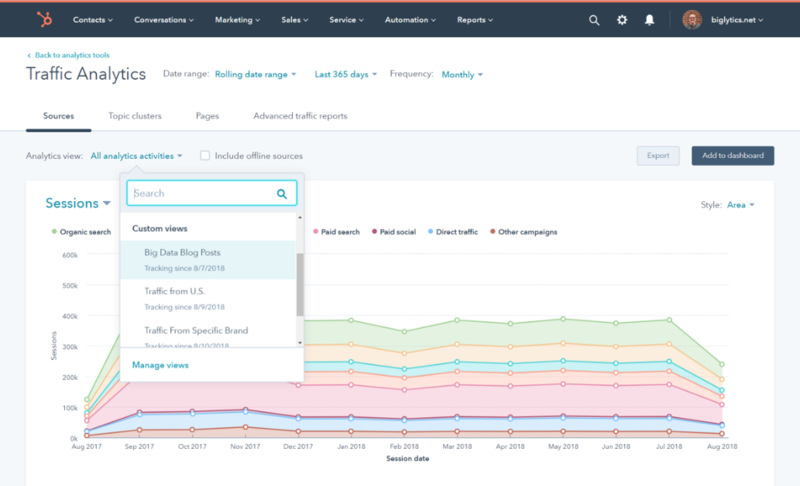 Since HubSpot acts as your CMS and CRM, its analytics tools will not only tell you what people are doing on your site, but who is interacting with it. That's powerful stuff. The HubSpot CMS makes it easy to create personalized content for your visitors. For example, let's say you're an attorney. You can swap out navigation links to display an offer of a free consultation to anonymous visitors and a client portal for existing clients. You can also used personalized content (called "Smart Content" in HubSpot) to display different content to mobile vs. desktop users. For example, you might display a shorter form to mobile users than you would to users filling it out on a desktop. Is the HubSpot CMS Right for You? The above 4 benefits of the HubSpot CMS are just the beginning. This comprehensive CMS platform also offers things like security, SEO, and tons of unique themes. While it's possible to get the same benefits elsewhere, you'll have to mix and match different products. All of this functionality comes at a price. The standalone CMS is $300/month and includes hosting. For some businesses, spending this much money on a website CMS doesn't make sense. For a lot of businesses, this price is well worth it. Not only do websites on the CMS outperform sites on Wordpress and the like, making updates and changes to HubSpot sites is a breeze.